The chap in the coloring sheet looks like he is having a great time observing space. There is just a single planet and star behind him. Have your child write a short narrative to go with this space robot. You can also ask him to make some more planets, asteroids and stars to give an appearance of the outer space. Wouldn’t that be fun. Robots are taking over the world, including the world of Disney. Baymax is the deuteragonist of the film “Big Hero 6. This healthcare robot is the member of the superhero team of the same name. Tadashi Hamada had created Baymax to nurse the citizens of San Fransyosko and his brother, Hiro. He wanted to improve the health care around the world. Baymax contains a particular chip with Tadashi inscriptions that provides him with the programming and overall personality. This robot dog is having a great time playing Frisbee with his master. It is quite a complex robot coloring and has loads of sections to color. We suggest you get the older kids to work on this one. This robot is having a hard time cooking. Can you ask your child to assist him in his chores by giving him some color? Do you think that robots will be our workers in the future? Discuss it with your child and see what he answers. He may even surprise you with his response. You can also hang the finished work on the refrigerator or drawing room for all to admire. Wall-E was a lonely robot at the beginning of the film and had only Hal as a company. But his life finds meaning when he meets EVE. He falls head over heels in love with her the moment he sees her and even starts imagining his future with her. Baymax is an intelligent robot. He is extremely devoted and caring towards his patients. He manages to keep calm even in dangerous situations. But he is slightly naïve and lacks the understanding of human emotion. Doraemon is the most adorable of the robots in the whole of the cartoon industry. The cute robot is the titular character of Doraemon series. Doraemon is a robot cat whom the futurist Noby sent to the 21st century to help his younger self. Doraemon has all the machines and gadgets that can perform a myriad of activities like evolving or devolving life forms, choosing the dreams, hypnotizing the inanimate objects and many more. Although Doraemon is a robot, he has the same emotions that we have. He is kind and intelligent but gets scared easily when things go wrong. Surprisingly, Doraemon is also terrified of rats. Rico also called Robot 1C0 is a robot created by Metal Alice. He is the second robot created by Alice, the first one being Rotox. Alice created Rico when Vrak demanded an efficient robot to take over the Warstar before Admiral Malkor re-emerges from the cocoon. Later, Emma takes in charge of Rico and teaches him the value of love, friendship and even fun and camaraderie. 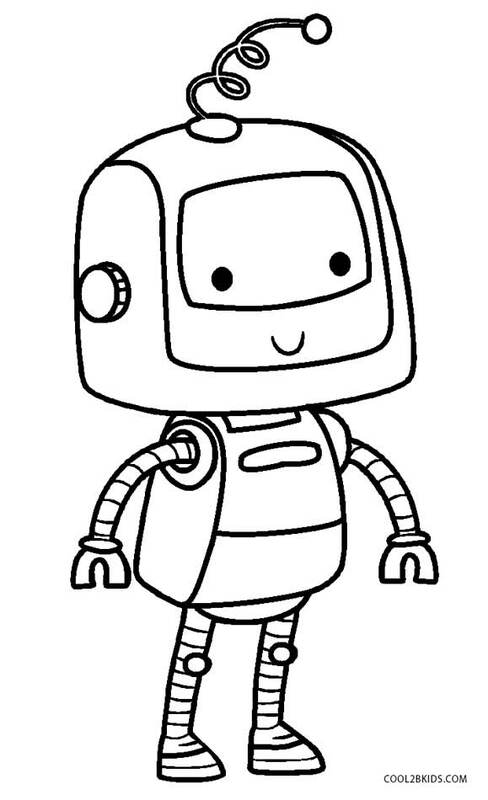 Have a sci-fi coloring session with your baby with this adorable coloring sheet. It features two robot buddies having fun hanging out with each other. But it needs a bit of color to look even cuter. Tell your child to bring out his coloring set and add some menacing colors to this robot pair. Your stellar sleuth is sure to have fun painting this image. Here is a colossal robot destroying the city by cutting down the trees. The robot looks quite sinister. Did you notice the convenient switch on this robot? We hope someone arrives and stops this robot in his evil endeavors. Bring this exciting scene to life by telling our child to add some colors to it. You can also ask him to give a name to this creepy robot. Robots are automatic machines that perform tasks assigned to them. They come in all shapes and sizes but mostly resemble humans or animals. By mimicking the lifelike appearance and automating movements, the robots convey a sense of intelligence. Most robots perform repetitive actions. These robots help to build cars in assembly lines. Some robots also perform dangerous activities like deactivating bombs and handling deadly chemicals. The house cleaner at work you see here is Irona, the wisecracking robotic maid for Richie Rich and his family. She has multiple gadgets that help her take care of Richie’s state and keep him from harm. Irona has some unusual powers and abilities. She is extremely agile, super strong and invulnerable. Irona always appears in her maid outfit and carries a feather duster in her hand. 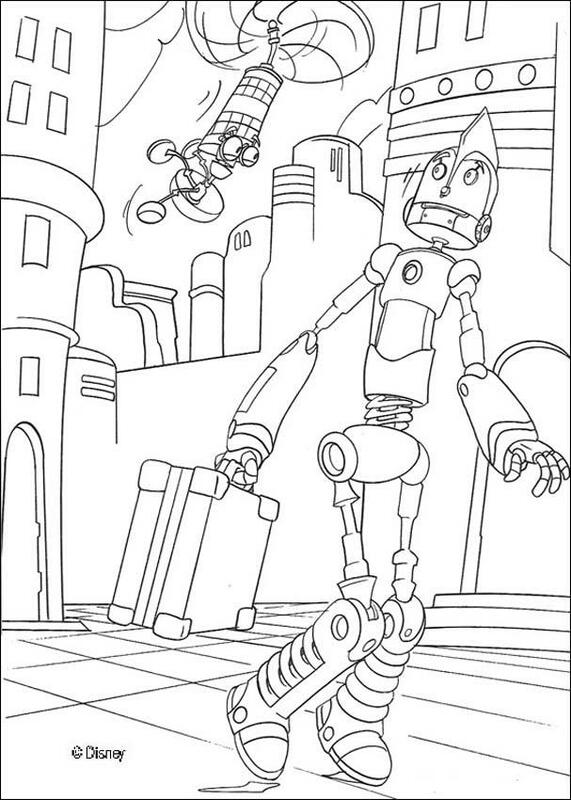 This one is one of the best robot colouring pages and one of our favorites. It shows a robot washing utensils, and he looks cool with it. We all know that robots work hard. They can do any work assigned to them, including washing utensils. Share the coloring page with your child and help him work on his fine motor skills by coloring within the lines. In the meantime, you can tell him a story to go with the picture. Here is a cute robot diagram for coloring. Tell your child to add some lovely colors to the scene. It will hone his fine motor skills as he colors within the lines. 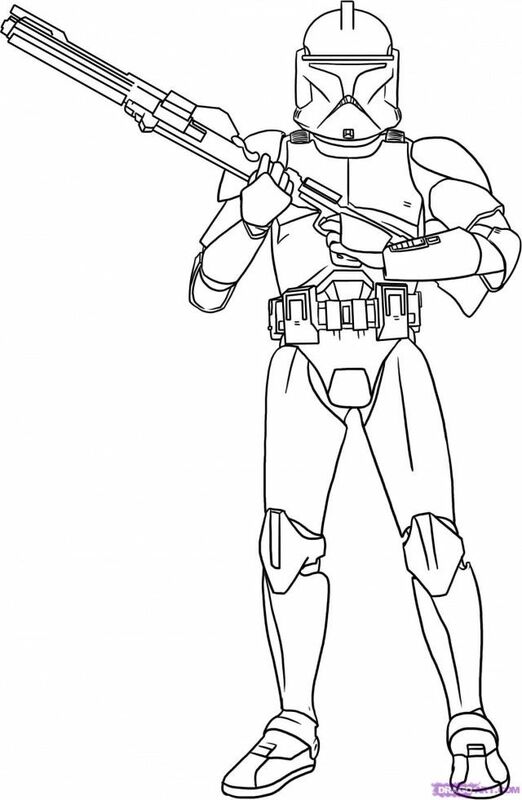 Your child can also cut out this coloring sheet to create a greeting card for his geeky friend. 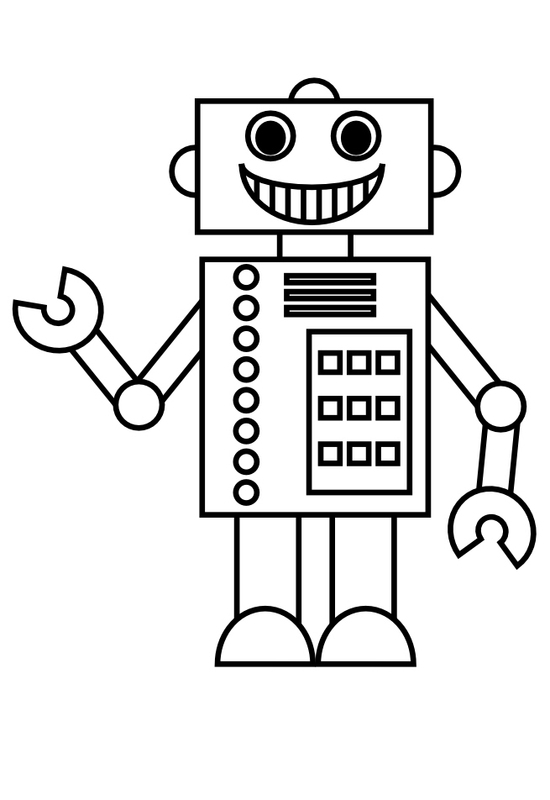 We would advise you to download all these robot coloring sheets to help children understand the machine better. And we are confident that your tyke will enjoy giving these machines a fun makeover. These coloring pages are also great to print out for birthday parties. Here is a simple coloring image with broad outlines. It shows a baby robot drinking milk from a bottle. Encourage your kid to add some crazy colors to the cute robot. This coloring sheet would be good for younger children to color. You can also encourage the fussiest eater in your house to drink his daily serving of milk as he illuminates the sheet. Is it a robot? Or an alien from the outer space? Is he sending a message back to his home planet? Only the child who is coloring this would be able to tell you that. The robot alien you see here is robot probe from the animated film Monster V/s Aliens. It is one of the antagonists of the movie and serves as Gallaxhar minion. Gallaxhar created this robot to get the Quantonium. The alien robot is very destructive. It has an impenetrable deflector shield that blocks all forms of attack, making it immune to any weapons. But its weakness is that it has very short legs and is hefty, so it trips easily. Wall-E is a small sized robot with the cube-shaped body, round eyes, two little eyes, a conveyor belt feet and an interior that acts as a trash compactor. 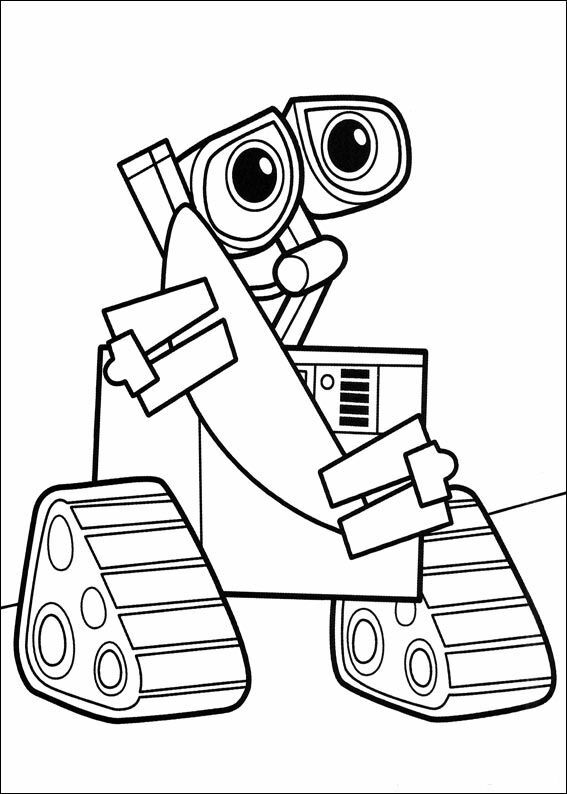 Wall-E was an entertaining movie, and you can get your little one to watch it before he colors Wall-E. The robot here is a conventional kind of robot, but he looks quite friendly. Do you think your child would want to be friends with him? But before that, you must teach your child about the sight and sound of alphabet ‘R’. Ask him the names of all things starting with the letter R. It will reinforce his vocabulary skills. And then get him to color the diagram. You can also encourage him to add metal washers, glitters or sequins to make this coloring page look extra special. Wall-E, a short form of Waste Allocation Load Lifter – Earth-Class, is the protagonist of the film of the same name. Megatron, the robot is the main antagonist of the film Transformers Prime. He was once the leader of the Deceptions during the Great War on Cybertron. Megatron is a fierce, scheming, sadistic, cruel and egotistical character. He is persuasive and manipulative and uses people for his benefits. He is extremely powerful, dangerous and a skilled combatant. He fights with just no fear and tempers it with its sheer cunningness. 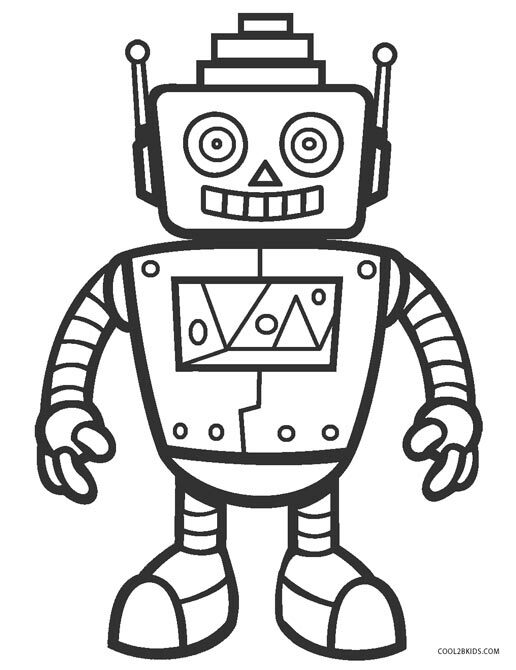 Did you like our free printable robot coloring pages online? If yes, then you must also consider going through our alien and vampire coloring pages. They will surely intrigue your child. Have fun with your child coloring the diagram of Carl, the robot who works for the Robinson Family. Carl has a strong, golden body and stretching parts, and his main job is to keep an eye on Wilbur and protect him from danger. Carl gets paranoid easily. He gets hysterical when he sees Wilbur doing something mischievous. He tries to keep Wilbur and Lewis away from danger but fails most times. He even has a series of mini-Carls that help him with the work, like serving dinner to the family. Rico’s personality is similar to that of a child. He learns quickly and takes the side of anyone who treats him well. The robot has a lot of fine details that will help younger children with their hand-eye coordination. And for older children, it will be a challenge to make it look as neat as possible. 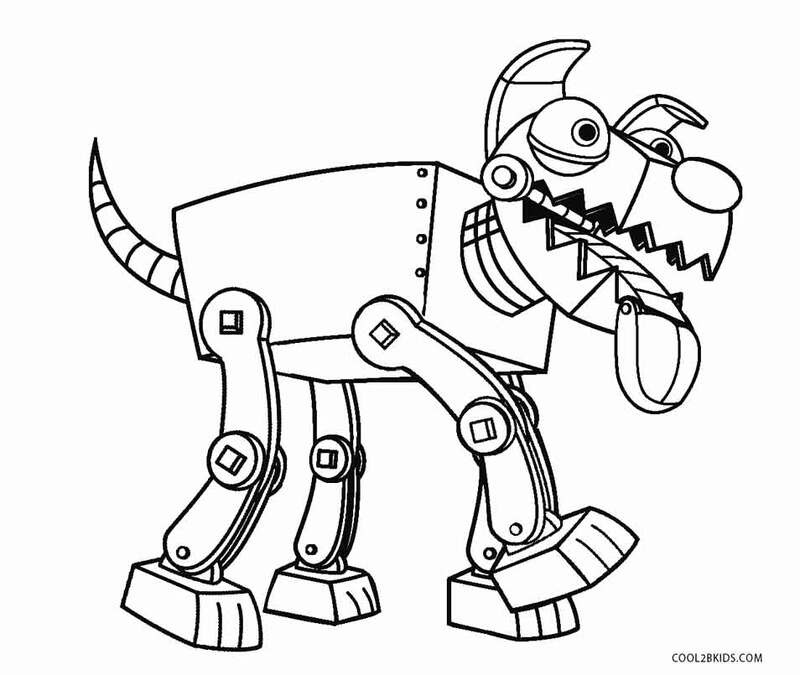 Get set to zoom into the world of machines with our free and unique set of robot coloring pages. The robots can be colored in a multitude of colors like silver, gray and black. Those who love it bright and vivid can choose from reds, pinks and oranges. Daily mundane tasks can be done in a jiffy by these automated devices. Hence, though essentially computer programs, they have been depicted in these printable pages complete with heads, bodies and limbs just like human beings. Some of the forms are simple and small while others are gigantic resembling the machines of the Transformers movie. The LED lights on their bodies can be given bright shades to depict the functioning of the automations. A dog robot could invoke interest in many young minds owing to its sheer body features. Wouldn’t a kid love to have a faithful friend by his side that wouldn’t have to be fed nor required to be cleaned off a mess of poo? Wall-E has a curious personality. He collects everything that he finds interesting while assembling waste. But years of loneliness have taken a toll on him. While most of the time, he obediently follows the directions, he sometimes gets distracted and collects the trash rather than compacting it. Here is a coloring image of QRIO, Quest for cuRIOsity. QRIO is a humanoid entertainment robot manufactured and marketed by Sony. The brand created it to follow up on the success of its AIBO entertainment robot. QRIO is a 2 feet tall robot and weighs 16 pounds. Its slogan is “Makes life fun makes you happy!” QRIO has many skills and abilities. It has flexible limbs and a camera in the center of the forehand. It is also capable face and voice recognition, making it simple to remember people’s likes and dislikes. Here is a coloring image of Manny with Fix-it, Manny’s pet. Manny is the handyman living in the Sheetrock Hills. He is the protagonist of Disney’s television series, Handy Manny. Fix-it is a blue-green colored dog with purple eyelids, orange ears, blue nose and blue wheels. Fix-it also has a red collar with a golden colored license wrapped around her neck. The collar helps Manny track her down when she gets lost. This weekend, why don’t you play Frisbee with your kid? It will be a great physical activity. It will help you let go of your smartphone, and it will give you an opportunity to bond with him. Do you want to introduce your child to technology from a young age? 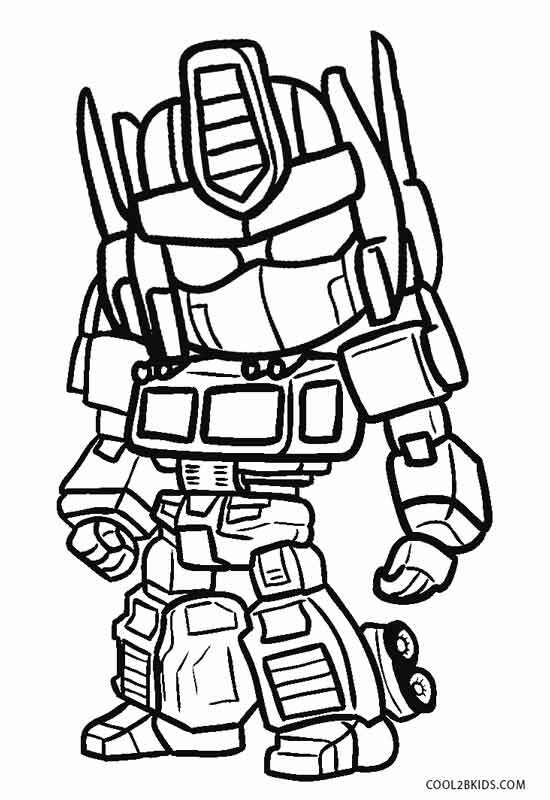 Or is your kid already into technology, and are you looking for some robot coloring pages to supplement his knowledge? 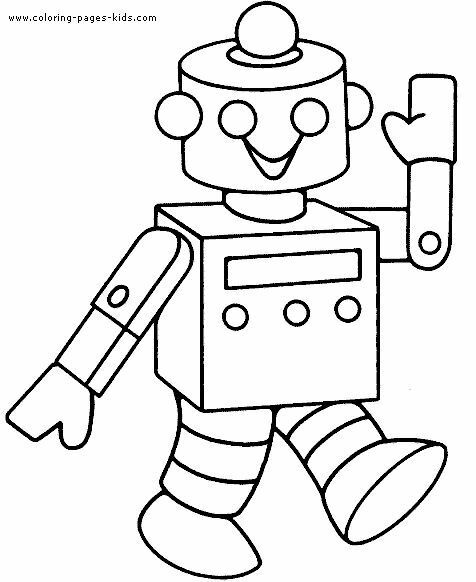 Whatever may be the reason, if you’re looking for some high-quality free robot coloring pages to print, then this is the perfect place for you. The sweet robot you see here is Rob, the curious and adventurous droid in the Robot Galaxy. He is the protagonist of the T.V. series Rob the Robot. Rob is the playful rock pilot and leader of the gang. Rob is an energetic character. He loves eating an omelet in the breakfast. Rob is fond of rock music too. Rob is a silver colored robot with an antenna on his head.